A New Year’s Celebration (oh, the scallops!) 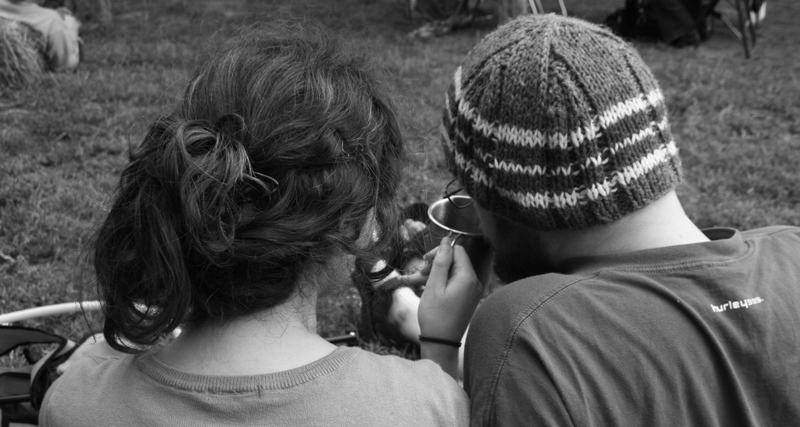 | "Il faut goûter"
Pinpointing the anniversary date in a relationship is tricky and perhaps unnecessary (first date? first kiss? first declaration of the other as “boyfriend”?). See, it’s blurry, and in my current relationship I’ve rather surprised myself at my apathy for remembrances such as this. I’ve just been happy we’re happy, and I smile to think on the evolution of us as a couple, breaking it down into ‘periods’ of the relationship themed on whatever was happening and the revelations that were made at those times. But Matt remembers the details. But remember, this is a food blog, and I’m not usually so personal with the internet public. What’s that anniversary date really good for? –A CELEBRATION, and if that celebration is going to be really special, it’s going to involve good food and drink! Who knows that? Matt! So he planned an evening for us (DINNER!). I went to his place last Thursday morning to drop off some fresh basil and he told me to hurry over after my yoga class that evening to begin the festivities. 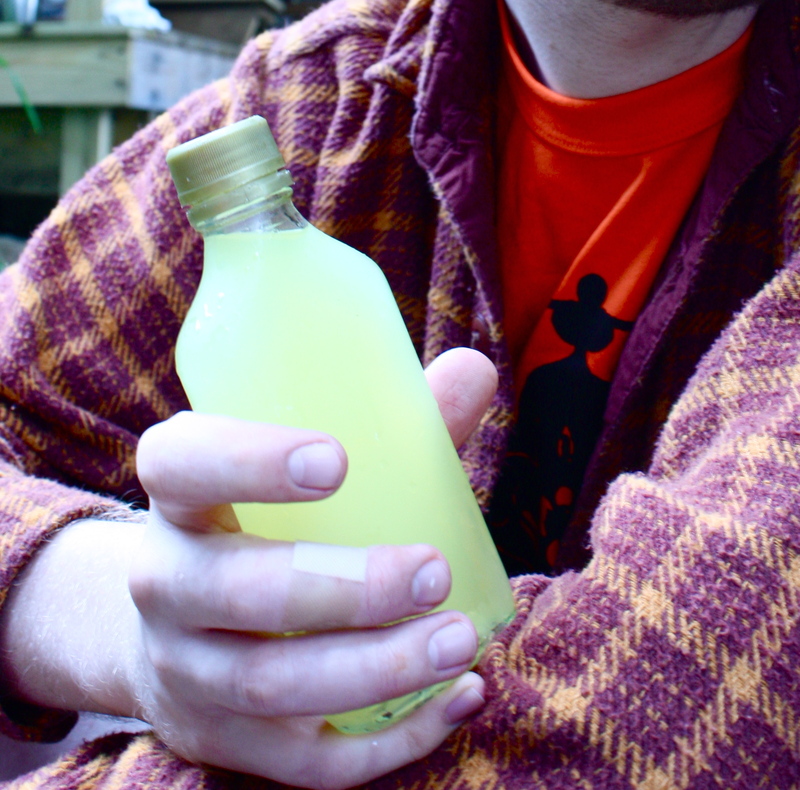 photo not from the date night, but same batch of limoncello! As an entrée (French meaning of the word, like first course or appetizer), Matt’s idea was to serve a vegetable salad in a more enticing form. He baked a long thin zucchini slice coated with olive oil and black pepper. Then he topped the baked zucchini with thinly sliced fresh roma tomatoes. 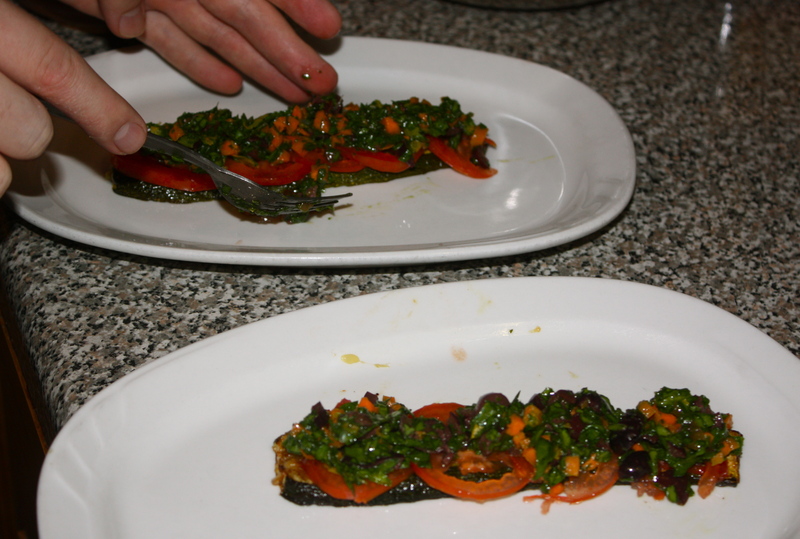 Then he topped the tomatoes with a sort of minced-up spinach bruschetta: spinach leaves, basil leaves, kalamata olives, and carrots, seasoned with olive oil, s&p, and a bit of lemon. 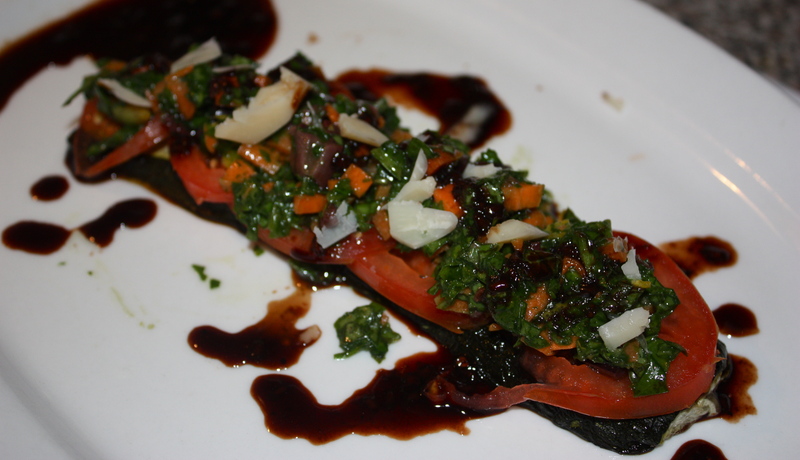 He drizzled the veggie dish with a balsamic-raspberry reduction and some fresh Parmesan shavings. what to call this dish? It’s a sort of oversized canapé, and it was lovely! I thought it would also be nice (though a bit heavier) if the zucchini slice was lightly breaded and fried, making it sort of a zucchini toast as the base. And Matt the chef’s critique: the balsamic reduction wasn’t thick enough. But most importantly, it was very tasty, and we cleaned our balsamic-covered plates in a manner of minutes. Next, the main dish, which was so good I can still taste it when I recall the memory. Why was it so good? Probably because of the bacon and the fresh parmesan cheese. This dish took two to prepare. Matt heated a skillet on the stove and asked me to get some containers out of the fridge. Those plastic dishes were full of SCALLOPS! I LOVE scallops! And what’s more, they were wrapped in bacon!!!!!!!!!!! Matt had taken half strips of bacon and coated them on one side with a bit of sea salt, black pepper, parsley, and onion powder. 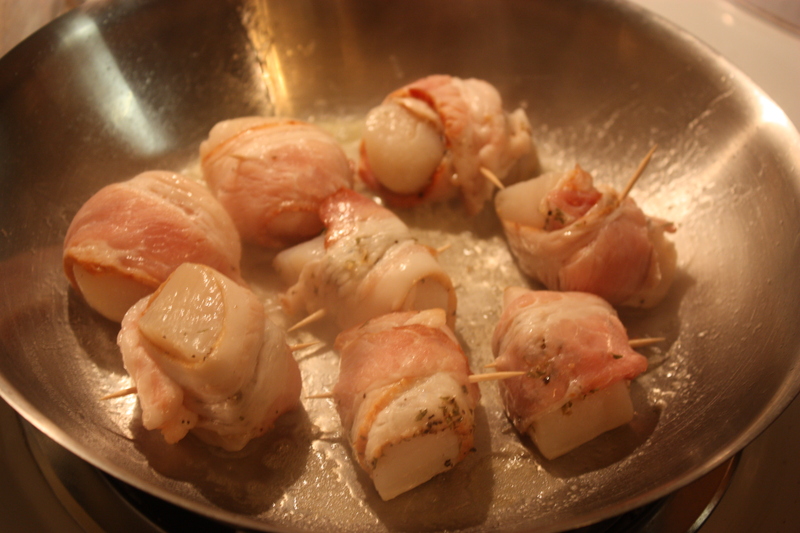 Then he wrapped the bacon (seasoned side in) around a plump scallop and secured it with a toothpick. He then squeezed fresh lemon juice over the wrapped scallops and set them in the fridge until cook time. You know that must be good. In a heated skillet, he seared the scallops, then transferred them to a baking sheet to finish cooking in the oven, turning them once during bake time. For the plating, that sauce was spooned atop farfalle pasta, and a mixture of chopped fresh tomatoes, chopped fresh zucchini, and chopped fresh basil was scattered on top. Those scallops (oh, those scallops!) were placed alongside and they got a drizzle of the cream sauce as well. This was so delicious–rich, creamy, salty and overall decadent. Those scallops are some of the best things–not the best scallops, but the best edible morsels–I have ever put in my mouth! As such a rich and heavy dish, you don’t need a large portion of it to be satisfied (I’d reduce the amount of pasta, not the scallops), but I wouldn’t change anything about the preparation. After this meal, we were rather over-full. Dessert was waiting somewhere, still a mystery to me, but there was no possible way for me to eat even an orange slice at that point. All through the evening Matt had been watching the clock as if there was something time-sensitive awaiting us. He told me to put on my shoes and we drove away at nearly 10 pm, going to do something that was a “first” for us. I had guessed it earlier in the night: the movies. We had never been to see a movie together. So alone in the theater we saw a late showing of Our Idiot Brother–a good, pleasant movie: good cast, pretty light, though highlighting serious issues–but the main reason Matt chose that film: Zooey Deschanel plays one of the sisters. Exactly a year earlier, we had seen Zooey on stage. After the movie, which I’d recommend (it’s not monumental, but very enjoyable–Paul Rudd’s the main character after all), we were back on Matt’s porch, ready (kind of) for dessert. Matt produced something I wasn’t at all expecting: homemade ice cream , but made without an ice cream maker! He found an ice cream recipe using only heavy cream, sweetened condensed milk, and whatever flavorings you wish to add to make it your own. 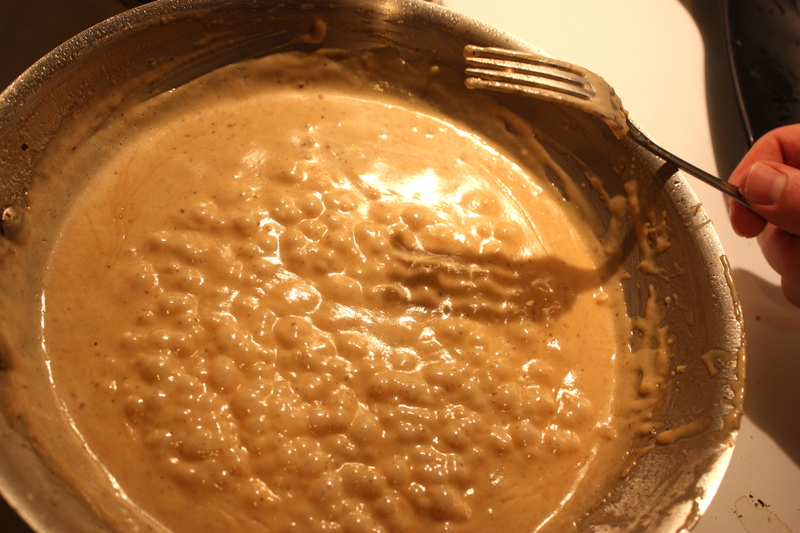 The result is a very thick and creamy frozen dessert, almost custard-like in consistency. 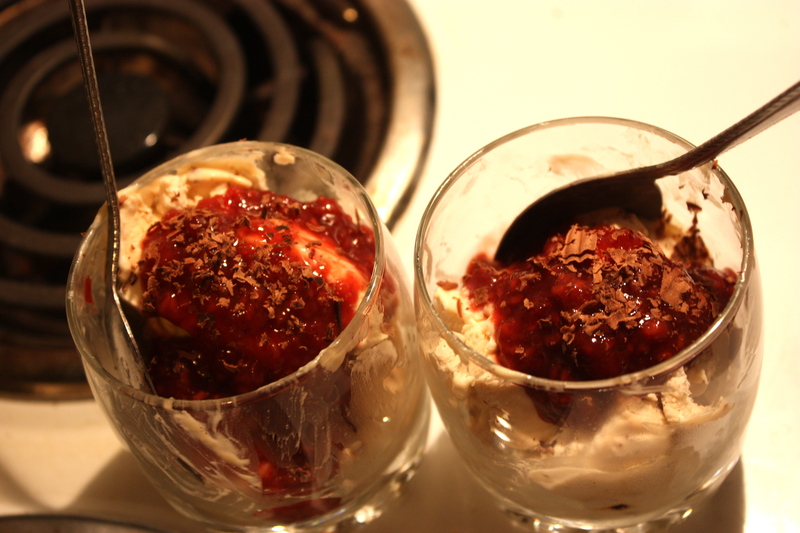 For our date night, Matt had made a tasty coffee ice cream, not overly sweet, and served it with a spiced raspberry sauce and dark chocolate shavings. It was perhaps not the ideal dessert after our rich alfredo, but it was yummy and also requires only a small portion to thoroughly satisfy. Matt was so pleased with this ice cream recipe (minus the whipping of cream with a whisk because he doesn’t own a mixer–sore arms for days) that he made a few more varieties in the following days. They were all scrumptious, and I plan to do a whole blog post on that ice cream recipe! Here’s to a perfectly delicious evening and a new year of happy times and good food! Thanks again, Matt! 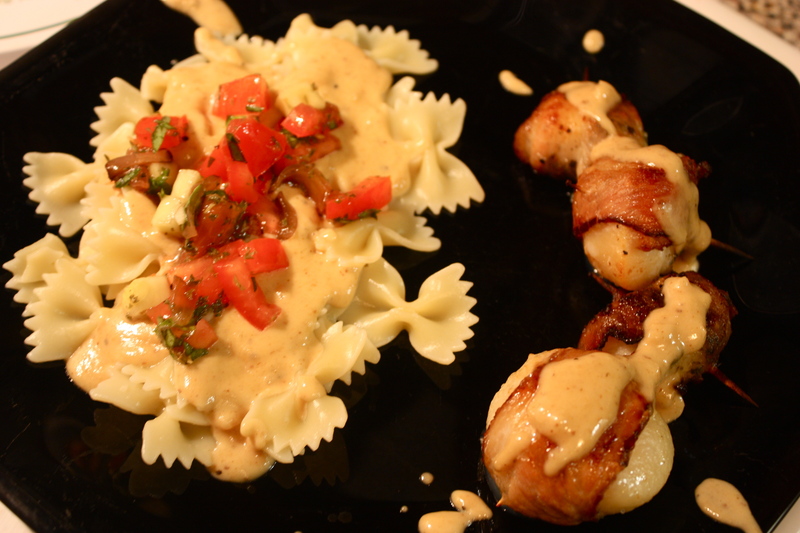 This entry was posted in Uncategorized and tagged alfredo, anniversary, bacon wrapped scallops, baked zucchini, celebration, date night, food, homemade ice cream, menu, recipe, scallops, zucchini appetizer by needtotaste. Bookmark the permalink. Matt, come make this meal for Allison and her mom. What a way to please ALL the senses!! This sounds amazing… will be sharing with my honey too! He sounds like a nice guy! !